Mango or Mangifera Indica is a tropical fruit grown in many countries of the world and the mango industry of South Africa has grown very rapidly in the past decade. The climate, the internal and external marketing trends and the socio-economic condition of certain areas of the country are favourable for its growth. The north eastern part of the country accounts for the major production of the state. The mangoes are grown in various altitudes from 350 to 950 metres above mean sea level. As of 2010, 7577 hectares were under mango plantations with Limpopo Province being the major producer having 5013 hectares. Other important areas where they are cultivated are Soutpansberg, North, Central and South Letaba and Hoedspruit areas. Mpumalanga Province has 1950 hectares of mangoes planted and ranks second next only to Limpopo Province as of 2010. KwaZulu Natal is the third largest producer. 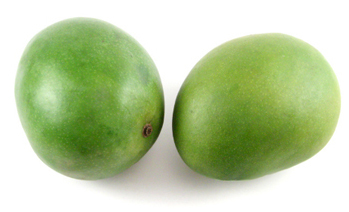 Many types of mangoes are cultivated in South Africa including Tommy Atkins, medium to large sized thick skinned mangoes, Kent, the greenish yellow sweet juicy variety with fibreless flesh Keitt, the rounded oval ones yellow in colour with red blush and Sensation, oval, oblique and less beaked type that are medium to small. The varieties like Zill and Heidi are also produced. They thrive well under flood irrigation or sprinkler irrigation and dryland production does not provide the expected yield. Mango trees are capable of tolerating various climatic conditions. They can survive even in swampy or very hot and very humid climatic conditions so the South African climate is conducive to their production. For good growth and yield the temperature in winter should not fall below five degree Celsius and they grow well where the temperature is very high. The temperature range of 27 and 36 degrees are optimum for their growth. However they are not grown in areas of heavy winds as may cause scratch marks on the fruits and fungi and bacteria that harm the fruit may enter through them. The yield of the fruits is greatly affected in windy areas and so they are not grown in plenty in these areas. They grow well in dry lands where the humidity level is very high and the soil can withhold the dampness. The South African mangoes take various shapes before they are shipped worldwide. They are turned into canned mango, mango pulp and mango juice. Other popular forms are dried mangoes, mango jams and creams. Since fresh mangoes spoil very rapidly, they are processed to make them into tasty varieties. The immature mango fruits are sliced and salted and are turned into various products like pickles. The mango pickles are indeed very tasty. The processing treatments not only improve the appearance and quality of the mangoes but also remove any diseases present in them. They make the fruits highly edible. The mango fruit juices have higher energy value and are used in many medicinal products. Tannins are removed in mango pits and mango kernels and are used to feed the livestock. The mangoes are also harvested when they are still small and they are known as achar fruits. The fibreless types are used for making pickles and mostly the small fruits and those that drop naturally before they are matured are used for this purpose. When they are allowed to stay on the tree for a longer period of time, they give better colour and better flavour and this process is called ripening. When they are picked green, they may not ripen properly and at the same time overripe fruit will soften too much and may develop diseases. The fruits that are picked too early or too late may not taste good. They are hard and green before the onset of ripening and progressively soften and change colour. They are harvested in the right time in South Africa and are sold both in local markets and international markets. South African mangoes are nutritious and tasty and also have great medicinal values. They are used to heal bronchial diseases and help to fight beriberi. They are also found to cure nervous problems and check insomnia. They are used as a laxative and are supposed to cure mental depression. Mangoes are not only delicious but also rich in vitamins like vitamin A and vitamin C and have other mineral salts. They assist in digestion and fight heartburn. High quality mangoes are exported from South Africa to many parts of the world. It accounted for 0.62% of the total mango exports of the world as of 2010. They are exported to France, Belgium, Canada, Japan, Indonesia, Australia, Switzerland, UAE, Saudi Arabia and Italy. USA was the largest importer of mangoes and it imported more than $340 million worth of mangoes as of 2010 and Netherlands was the second with $150 million and China the third with $155 million of mangoes. Since South Africa has made preferential trading agreement with the European Union, it allows the free entry of South African mangoes. The entry price system of EU decides the percentage of customs duty and this affects the export to some extent. The South African mangoes have free access to USA markets. The mangoes are sold through three distinct channels. They are directly sold out to an importer with or without the help of an agent. They are at times contracted out to the importers that help them to take the advantage of the economies. The producers can also join the cooperative export organisations which will help them to find the importers. The mangoes of South Africa are sold under their own name or named on behalf of the importer and care is taken in labelling and bar-coding procedures. The agents contact the buyers of the importing countries and take a commission of two to three per cent. The mangoes are transported through sea or air. Ocean cargo is a long process but the cost is much lesser and so if it has to be sent through sea, the picking has to be done quite earlier and shipped when they are relatively fresh. The ports have special facilities to handle fruits. Durban has a new fruit terminal that helps in quick transportation of fruits. Mangoes that are produced in the orchards of South Africa are harvested, processed and exported. They enter the market for fresh consumption. They are also sliced, canned, juiced and dried and transformed into various forms and sold in local and international markets. With all innovative technology in production and processing and also due to their great tastes, South African mangoes are getting popular in many parts of the world. Mangoes are so popular in South Africa, that a low cost carrier - Mango Airlines - even named themselves after the fruit!